The security updates for Outlook released on September 12, 2017 are affecting the contentACCESS email archive. The users are no longer able to open the original archived messages from shortcuts, only the shortcut itself. This is caused by the Microsoft’s decision to disable Outlook form scripting by default. 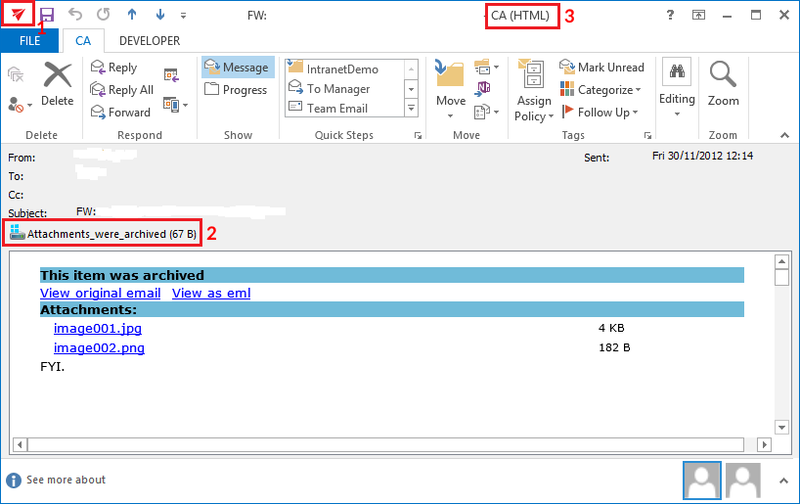 After installing the security updates for Outlook, emails that were archived by third-party application are showing an unwanted behavior. All programs and applications using custom Outlook forms are affected. The security patches are preventing archived emails from opening. When the user double clicks on an archived email (shortcut), instead of the original item only the shortcut is opened. The attachments are only accessible if the shortcut was configured to contain the links. Choose the right *.reg file depending on your Outlook and Windows versions and apply it on the client computer (by executing the *.reg file). If you need any help with solving your problem with custom Outlook forms, just contact us at support@tech-arrow.com.